Tammy Faye Messner succumbs to cancer. So many things I had intended to blog about over the weekend before the power decided to take a two day vacation and this bit of news was one of them. (CNN)—Tammy Faye Messner, the former televangelist and Christian singer who battled drug addiction and later inoperable cancer, died Friday morning, CNN’s Larry King said Saturday night. He said the family had asked him to make the delayed announcement. 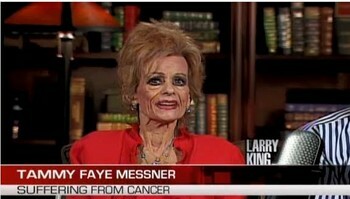 Messner was a guest on “Larry King Live” on Thursday. She told him she couldn’t swallow food, and weighed only 65 pounds. Click to embiggen. If you dare. Tammy holds a unique spot in my heart because an entry I wrote about her getting cancer was one of the first ones to earn me a rebuke from more than one of my regular readers. My entry was mean-spirited because I had no real sympathy for the woman considering all the damage I felt she’d done over the years to so many other people. When I saw her on Larry King the other day I have to admit that I finally felt a pang or two of sympathy for her. As you can see she looked absolutely terrible and I gotta give her credit for sitting there and doing her best to have a positive attitude given the state she was in. I still can’t say that I’m sorry to see her leave this world behind, but I can say that I do have a little sympathy for her after all. I’ve watched a number of people grow sick with cancer and I have a good idea of what she probably went through. I wouldn’t wish it on anyone. Not even Tammy Faye. This entry was posted in Uncategorized and tagged Cancer, R.I.P., tammy faye by Les. Bookmark the permalink. Her handling of the situation is an indication of her personality at that point, but affected by burdens as it is with anyone. Once someone knows suffering they are less likely to spread it (or at least more aware of it), and that I think is in part why Les feels sympathy. And I will be honest and say I do wish pain and suffering on those who inflict it on others without appearing to know the effect they’re having, as a way of educating them. If they want to spread suffering for benevolent reasons (to minimise long-term suffering) like aiming to strengthen people or showing their shortcomings, then I will permit that as long as they know what they’re doing and I’d try to make it meen something to the recipient, and help after. I care for all but I am cold hearted, because I need to be for what I want to do and to maintain my sanity in a world like this. Loved her on Surreal Life! Her and Ron Jeremy must the greatest pairing in reality TV history. Over on UTI, Hank Fox has a rather uncomplimentary perspective on her. Think of all the people they promised healing… all the false hope. No, I don’t wish cancer on anyone, but I hope it makes the other god-shouters think. You wanna talk about spiritual enlightenment, about love and community and support and forgiveness, fine, but don’t make promises of healing to dying people. It’s just wrong. I don’t know; there may be cases where false hope is better (when dispensed with an eyedropper). Tammy and her cheatin’ guy were dishing it out with a snowplough. But people extract wrong ideas too, because they havn’t yet dealt with them and so need to think on them to broaden what information they have to draw on next time round – a lot of people here used to be xians because they didn’t know better, but knowing more about it changes how they interpret xianism on the second analysis and what thought they get from dwelling on their ideas next time round. People need (and are determined) to fall into psychological traps and make mistakes at some point, because otherwise it would happen eventually anyway. Thanks, but I saw enough of Skeletor in the 80’s. It’s only a theory that she has cancer.